3D printing has been present in the art world in many forms, from renovating sculptures to pottery. It also allows for the reproducing art in various forms, recreating pre-existing designs and paintings. However, the Open Press Project is taking a different approach by bringing democratising vintage art reproduction devices themselves. 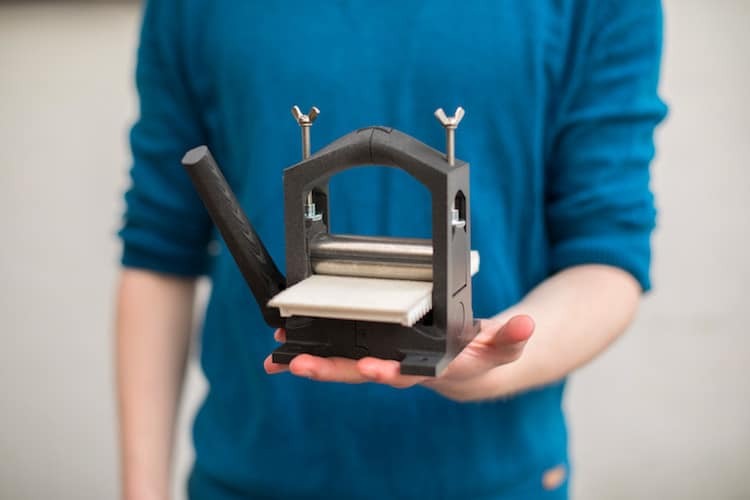 The project wants users to build their own etching press using freely available designs they provide online. They hope to popularise this method through a miniature version of the device. The original technology of the printing press, while useful, is very expensive. These often heavy, clunky machines can be unbelievably impractical, so they aren’t all that accessible. Martin Schneider, head of the Open Press Project, sought to remedy these drawbacks. So far, it’s been a success, with over 12,000 people worldwide downloading his designs. It’s not the biggest of machines but it can get people started. Its maximum paper size of 145✕75mm can be limiting, yet the quality is stellar. No doubt, the project’s open-source nature will allow designers to do their thing and come up with bigger versions. That said, in comparison with its anachronistic counterpart, the 3D printed printing press is light and cheap to make. Users can employ it towards reproducing their own etchings, dry-points, engravings, woodcuts, linocuts and other relief printing products. It’s all open-source, so as long as people are using it for non-commercial purposes, users can edit, copy and print it as much as they like. Schneider’s work has gotten so popular that he even held the first Open Press Project exhibition in Cologne, displaying over 250 tiny prints with roughly 100 artists participating. It’s certainly bringing back an old style of technology and art using new innovations. As the Open Project website states: “After more than 300 years of nonexisting innovation in the design of a printing press it’s time to take it to the next level“. Featured image courtesy of the Open Press Project.